WAY, WAY back. . .sometime in 2013 (see, loooooong ago), Therese of Therese's Treasures (another Alabama gal) contacted me and a few other creative ladies to see if we would be interested in a challenge. 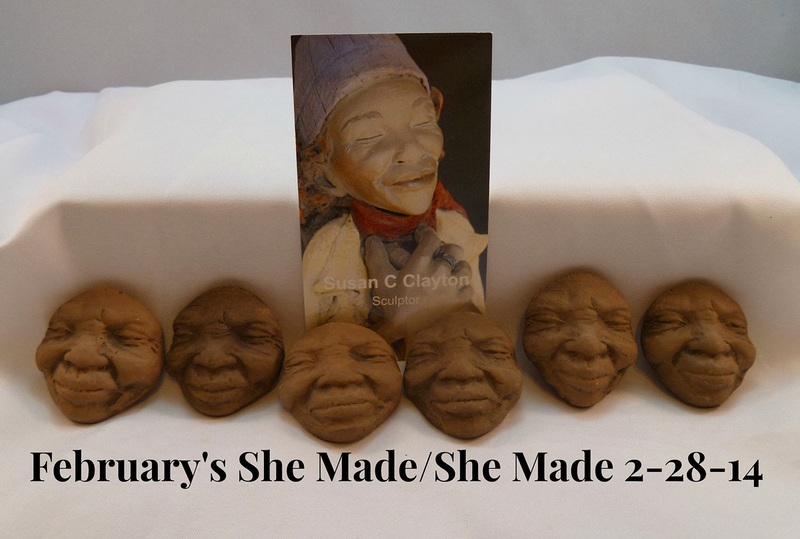 You see, while shopping at a craft fair she stumbled on these beautiful clay faces made by local sculpture artist Susan Clayton. The maker had a basket of just the faces and Therese grabbed several. Obviously, I couldn't turn away from this challenge and said, "YES!" Therese was generous enough to give us lots and lots of time for this challenge. So I was able to ponder it for many months. Unfortunately in those many months, I didn't take a before picture of the face she sent me. Instead, I studied it. In that face I saw care, concern, wisdom, gentle-ness, and love. I saw Mother Nature, and that's what I attempted to make. The other ladies participating in this challenge have some mad seed-bead skills, and I'm sure they've woven intricate details around their faces. Me? I played with moss and resin. 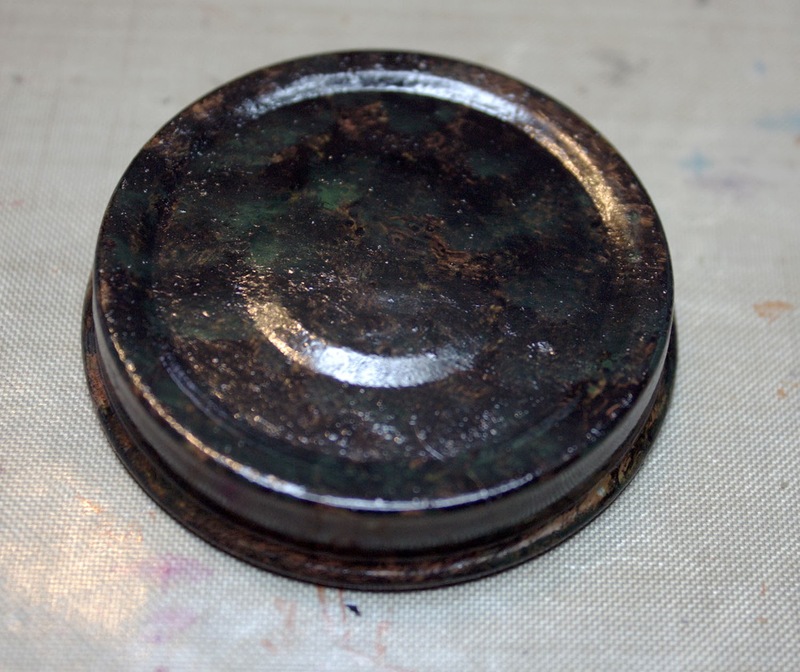 The actual base to the pendant is a lid from a baby-food jar that I layered with Vintaj Patinas. On the inside of it is some fluffy moss that I glued in with resin. I kept the resin coating at the bottom of the 'bezel' so as to not make the moss shiny and wet-looking. 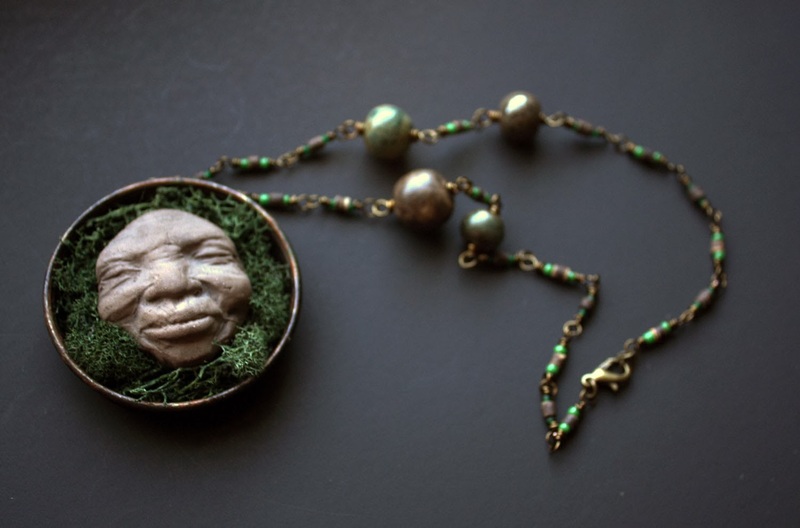 The face is attached with epoxy jewelry resin. Of course, you can't really see those details unless you look real hard. For the necklace, I wanted to keep it simple. I had intended to just make a chain of the green seed beads and tiny wood tubes, but the hubby suggested that I add a few accent beads to give it some interest there too. 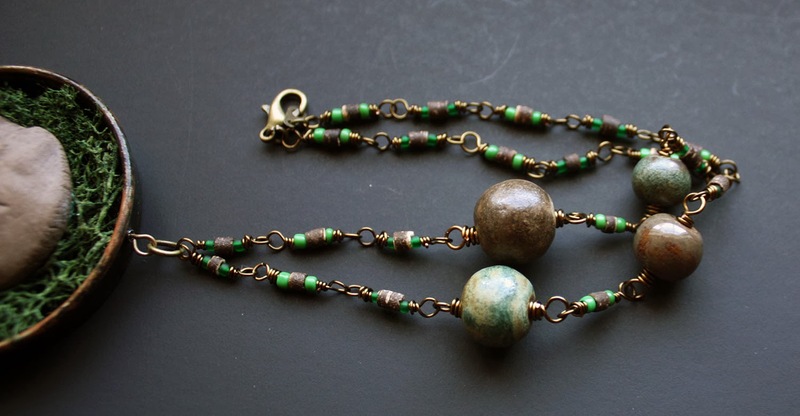 I sorted through most of my stash before realizing that these Gaea ceramic beads were a perfect fit. Between the face, metal lid, and resins; the pendant is a little heavy. With that in mind, I made sure to make the chain fairly short so there's not additional strain on the neck. I'm talking like it weighs 50 pounds or something. It totally doesn't, and I probably just over-thought that too. This challenge really give me a chance to step outside my usual materials and play with a variety of ideas. I can't wait to see what the other artists did with theirs. Here's the list of them so you can hop over and see what they created as well. Thank you so much Therese for letting me participate in this round of She-made/She-made. It's been a definite growing experience. Oh Wow Hope, I love what you made with your face. What a cool idea. 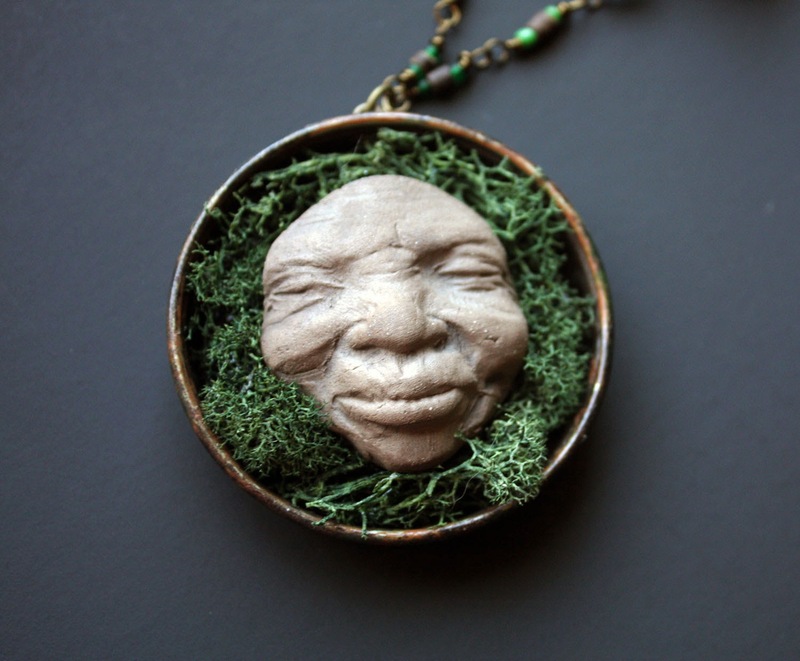 Using the moss around the face is perfect and the chain you made is spot on for the pendant. You are right these faces do have all those emotions wrapped up in one face. Thank you so much for participating in this little challenge, Hope. 'Walking' the blog hop I wasn't sure what to expect, I thought mostly everyone would use seed beads and weave the bezel... I sure didn't expect moss! but it's such a fabulous idea. I love your hubby's suggestion to add the ceramic components, they all blend in together in your Mother Nature theme. She's truly a Gaia ! I love her. Love that you stepped out of the box into the garden! Your hubby was right I think about needing some weight up in the necklace. Love! Janet- Thank you so much! And, my husband is usually right. You should see the happy dance I do when I get to be the right one. It's joyous, but not pretty. ;) I'm just glad he's there to help steer me in the right direction sometimes. I adore your unique treatment of M. Nature, giving her a cozy resting place and beautiful adornment, Hope :) Awesome design! 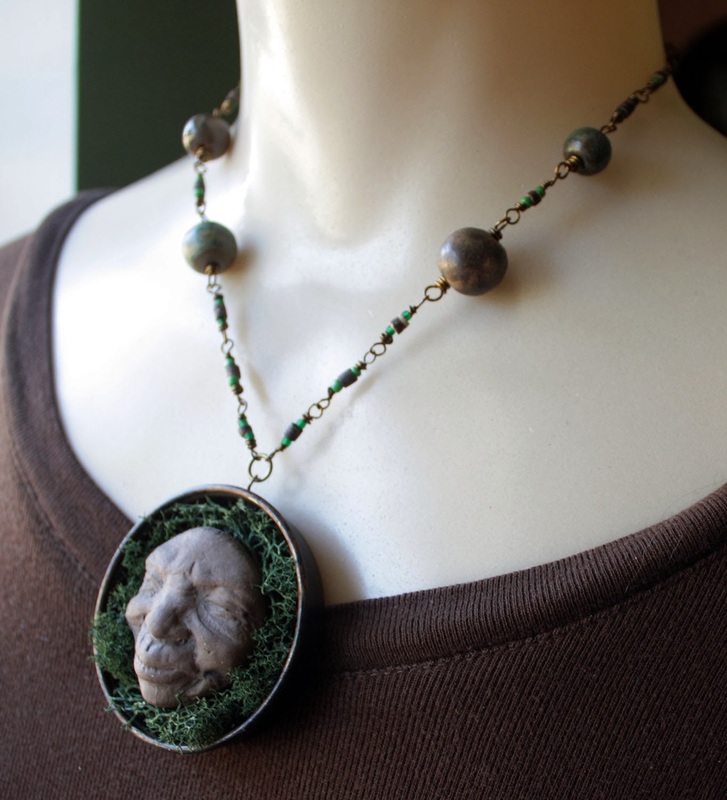 Mother Nature indeed - and around your neck, protecting you all the time! She is just awesome!! Shel - Thank you! Her face just spoke to me and I'm so glad I listened. I appreciate you hopping in! Oh, Hope, Mother Nature is the perfect interpretation of this face, and I absolutely love the way you framed her. Moss and resin? Genius! She does look like mother nature. Your design is really creative. I love the moss. It's perfect. Hope I just really love your lady! She looks like 'salt of the earth' and someone who has the wisdom of the ages. She is simply beautiful, and natural in the way you captured her. The moss just wonderfully frames her face - LOVE! Cynthia- Thank you! She really just spoke to me with that depth to her. I appreciate your support as always. Oh, I love that you paired Mother Nature with a baby food jar lid. So poetic. Perfect. Skylar- Ha. I just didn't have a bezel big enough but do have some jar lids hanging around. It worked out well. Thanks so much for popping by!